Before the work begins though, taking a few preventative steps to ensure equipment is prepared for the season will provide the best opportunity for success and profitable results. First, be sure to thoroughly clean all colourizer lines. This can be done by simply running water through the lines to ensure any dirt, debris or containments are cleared out. Next, inspect injection lines at the top of the grinding chamber to make sure they are not restricted. Even a small amount of buildup in this area should be cleaned and removed to ensure the process is as efficient as possible. Check the water supply and the water lines. Make sure they are clear, clean and that all connections are fitted correctly. Also check the colour pump lubricant level to ensure a sufficient amount is present in the pump. Finally, be sure to test the colourizer system before starting, especially if you're starting the colour pump for the first time after the winter. Testing can be done by simply running a five-gallon bucket of water through the system to ensure all components are working properly. As mulch producers navigate through the spring months when weather can continue to be unpredictable, and especially as temperatures can dip back below freezing, a few additional helpful tips are listed below. If you are operating in temperatures that are below freezing, it is important to drain the colourizer system after use to prevent any liquids from freezing within the colourizer or water lines in the system. Also, do not use frozen colourant. Using frozen colourant can lead to unequally mixed colours and damage and obstructions to the colourizer lines. If, after following these steps, something is not working property or your output is not providing the results you need, contact your equipment's customer support team to assist with any questions. 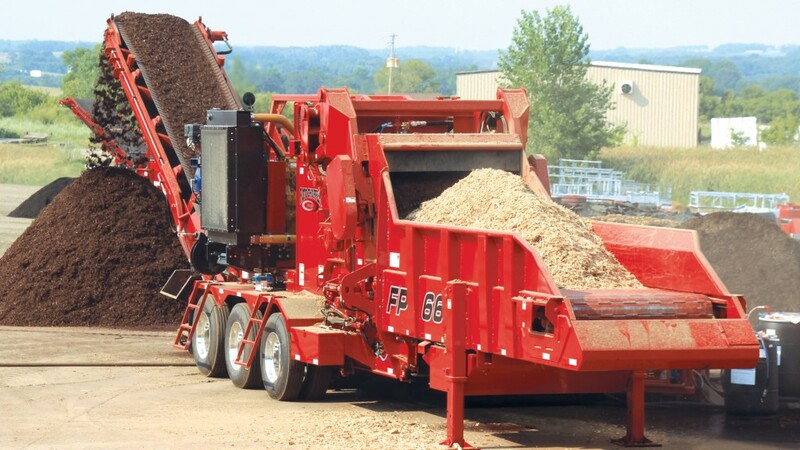 For more than 25 years, Rotochopper has specialized in efficient solutions that transform organic waste materials into premium products like coloured mulch, animal bedding and compost. Rotochopper offers the only patented in-chamber colourizer system, allowing organics recyclers to obtain more consistent output while minimizing waste. Doug (Spike) Meyer is director of customer service, Rotochopper. The Eddy Current Separator (ECS) is one of the most important pieces of equipment in a recycling operation. For operators of MRFs, auto-shredders or e-scrap facilities, it's usually one of the biggest revenue generators. Keeping the ECS running is important to the recycler's bottom line, therefore it is essential to reduce unexpected downtime. Michelin and Camso have reached an agreement whereby Michelin will acquire Camso, headquartered in Magog, Quebec, and whereby the two companies' off-the-road (OTR) operations will be combined to form a new division to be managed from Quebec. Alliance Tire Americas, Inc. (ATA) launched a rugged, new line of Galaxy brand radial off-the-road (OTR) tires at Waste Expo in Las Vegas. Built for the special demands placed on loaders, dozers, backhoes, foklifts, articulated dump trucks and graders, the Galaxy radial OTR line features all-steel radial construction for puncture resistance and reduced heat buildup, as well as special compound for longer service life, according to Brian Sheehey, Vice President of Marketing for ATA. The result is a line of tires that deliver outstanding performance and a lower total cost of ownership. Pegnitz, Germany - Recently, BEKAWORLD held a groundbreaking ceremony for a new plant in Wannberg, Germany. As one of the leading Off-Highway tire manufacturers worldwide, BKT has been able to find solutions even for the most demanding and toughest operating conditions in recycling applications by means of specially designed products for loaders and material-handling machinery. This sector and any related application areas appear to be fairly interesting in terms of tires that are subject to severe strain. Not only do they have to meet the requirements as far as resistance and durability are concerned, but they must also offer stability to the equipment and thus a certain level of comfort to the operator. According to a recent survey of Independent Equipment Dealers Association (IEDA) members, the EPA’s Tier 4 mandates are driving up the demand of non-Tier 4, used construction equipment and predicts this trend will continue for the next several years. For many equipment categories, used equipment availability is outpacing demand, but for other categories, including excavators, backhoe loaders, wheel loaders, dump trucks dozers and compact equipment, IEDA members are seeing resale pricing increase by as much as 20 percent. Also, more than 50 percent of survey respondents noted that quality used equipment is getting harder to find. Camso, formerly Camoplast Solideal, continues to strengthen its construction tire portfolio with the launch of two next generation skid-steer tires. Power management company Eaton has announced the launch of the GH100 and GH101 hoses for high-percentage biodiesel blend and high-temperature oil applications. Unlike standard fuel hoses that only last 1-2 years, Eaton’s GH100 and GH101 solutions are engineered for maximum performance in systems with a variety of fuel types, featuring a unique polymer that more effectively resists degradation. Indeco North America has launched the LUBEMAXX automatic greasing system for hydraulic breakers.